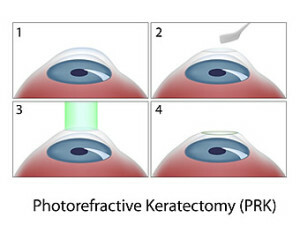 Photorefractive Keratectomy (PRK) is similar to LASIK eye surgery, in that the same type of EXCIMER laser is used but a corneal flap is not created. Instead, a laser beam is applied directly to the surface of the eye to reshape the cornea. PRK is used less frequently because of the development of LASIK, but in some individual cases, PRK may still be the procedure of choice. The initial healing may take several days longer than that of LASIK, but the long term effects are the same. The EXCIMER laser, which is a specific type of “cool” laser, generates its power from light in the ultraviolet range. It cannot be visualized by the human eye. Because the laser does not generate any heat, there is no tissue damage as the result of the laser light. The energy of the laser simply causes minuscule amounts of corneal tissue to dissociate at a microscopic level. As the treatment with the laser proceeds, microscopic layers of tissue, approximately 1/10th the width of a human hair, are removed. The laser is programmed to remove precisely the amount of tissue needed to achieve the desired result.